The question now is whether the same type of fun can continue in a part of town where massive change might be afoot. For the last several decades, this relatively isolated Brooklyn peninsula that juts into the New York Harbor has managed to sustain the hushed vibe of a small seaside village where, as O’Meara said, “Everyone knows your name and what you had for breakfast before you get out of bed.” But last month, the specter of progress threatened to change everything. AECOM, a global engineering firm, released an elaborate 61-page “framework to explore potential development scenarios of Southwest Brooklyn” -- with much of the focus on Red Hook. The document calls for a massive buildup of new housing and three new subway stops. In a far-flung neighborhood of roughly 11,000 people, located more than a mile from the nearest subway station -- about eight minutes by car, 15 by bus (without traffic) -- the idea of developers swooping in and disrupting everything is understandably controversial. Of course, Red Hook knows a thing or two about massive sea flooding. In 2012, Hurricane Sandy devastated the area. But it was that small-town ethos of the community, where everyone helped each other, that many of the locals say got them through the disaster. That commitment was readily apparent during Sandy’s aftermath. Ask anyone who lived here in the storm’s wake and they’ll tell you plenty of stories about neighbors pitching in to share supplies and pump water out of each other’s basements. Durney’s restaurant was slammed with 6ft of water, just months before its grand opening. Undaunted, he fired up a smoker right out on the street and cooked thousands of pounds of donated meat to help feed hungry hurricane victims. Scandinavian retailer IKEA, which operates a massive warehouse-like store nearby, donated furniture and space for disaster relief efforts. And a coalition of local business owners and stakeholders, Restore Red Hook, raised nearly $500,000 in relief funds to be shared among its members. 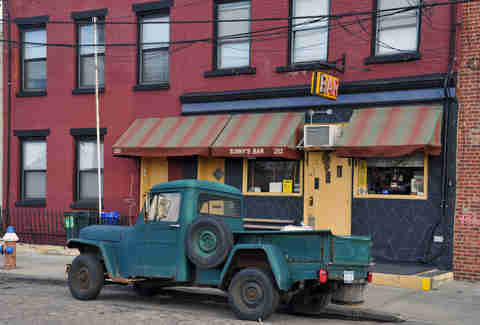 Sunny’s was the neighborhood watering hole -- literally (for many years) and figuratively. Owner Sunny Balzano originally only opened Friday nights to give neighbors a place to hang out -- but the energy he brought to the community, as well as the artsy communal vibe, are what brought a lot of newcomers to Red Hook, and ultimately what made some of them stay, like Bait & Tackle’s O’Meara, who first came in 1995. Back then, though, things were different. “It was cars on fire every night, for insurance,” recalled Tone Johansen of her arrival in Red Hook on a cold winter's day in January 1996. Johansen quickly met Balzano, who helped introduce her to the neighborhood, soon after her arrival. She had come to New York from her native Norway on a P.S. 1 art grant and needed to find a cheap room. At the time, a lot of artists had started trickling in after being priced out of neighborhoods like SoHo and Williamsburg. She ultimately married Balzano, helped him run Sunny's -- which is currently open six days a week -- and now owns it since his death earlier this year. AECOM's plan would surely continue that. The document recommends 45 million square feet of redevelopment in the area, featuring a mushroom-like proliferation of 45,000 new housing units, a quarter of which will be the so-called affordable kind. The framework further calls for three new stops on a subway line extending from the 1 train at Rector St and under the bay through Red Hook to connect with the existing Smith-Ninth Station. It's not just businesses and renters who are feeling the concern. "The front" of Red Hook near the BQE is home to the Red Hook Houses, the largest New York City Housing Authority development in Brooklyn. Over 6,500 residents live in 30 buildings, earning a median $14,000 annually. Eisenhard noted that there’s no public high school in Red Hook (there is a charter high school as well as public K-5). The RHI has 75 teenagers who attend 40 different public high schools, from Coney Island to the Bronx, some traveling an hour and a half each way. The AECOM document doesn’t make any specific recommendations for a public high school. 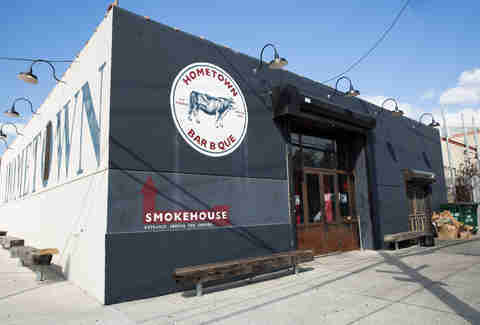 Still, not everyone in Red Hook is so opposed to the idea. Durney believes his business, which averages between 4,000 and 5,000 customers a week, wouldn’t be negatively affected by development of that caliber. Durney is also planning to open a 35- to 40-seat fried chicken restaurant on Van Brunt in the next few months. Truth be told, most neighborhood businesses could probably use an uptick in foot traffic, especially during the winter months. On a summer weekend day, Brooklyn Crab will serve as many as 2200 customers, while The Good Fork can hit 125 on a Saturday. But as the days get shorter, business drops. “When it is cold, people don’t come down to Red Hook. It’s a real Coney Island effect,” said Kim, who counts maybe 20 diners on a typical weekday night during winter. While some neighbors are leaving for more affordable parts of town like Ditmas Park -- “because who can afford these crazy rents?” -- Kim and Schneider, who own their house, are sticking it out, recently signing another 10-year lease on The Good Fork. On the other hand, too much development could seriously compromise the area’s existing charms. Brian Davis, who opened the men’s vintage store Wooden Sleepers two years ago, talks about the uniqueness of Van Brunt St, Red Hook’s main drag. Davis had always wanted to be part of a small business community that supported each other -- a place that reminded him of the seaside town he’d grown up in, in the North Fork of Long Island. When he came to Red Hook in the dead of winter, in January 2014, he somehow knew he’d found what he was looking for. Valerie Feingold, who moved to the neighborhood in 2011, actually wouldn’t mind it. “I didn’t think, 'How ugly,” said Feingold, general manager at the immensely popular, tri-level Brooklyn Crab on Reed St, just around the corner from Van Brunt. During peak summer season, the restaurant handles about 2,200 guests on a typical Saturday. “I thought, ‘How cool.’ We’d be getting a subway out of it, and that would be huge. For me, the more people who can come, the better it will be for business. 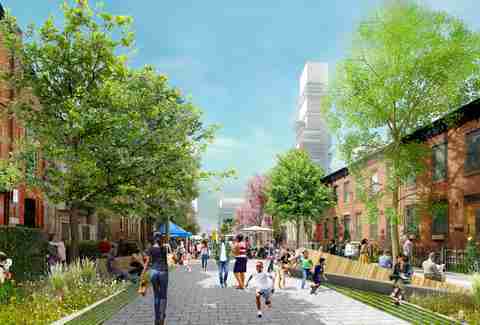 But this isn’t the first time Red Hook’s been targeted for some over-the-top development, and skeptics are saying this latest real-estate fantasy is just that -- a pipe dream. In an emailed response, AECOM said, “Extending the subway to Red Hook is a viable option based on a certain level of development that would fund it. This is similar to what was done successfully with the recent 7-line extension.” It also stated that there is no time frame as of yet. Even if the engineers' grand vision for sweeping changes never comes to fruition, Red Hook seems destined for new development. 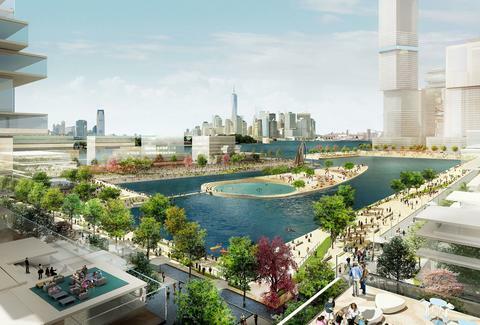 Last year, LA developer Estate Four announced a five-year plan for its upcoming 12-acre, mixed-use Red Hook Innovation District, while Thor Equities kicked off waterfront construction for Red Hoek Point, a 7.7-acre, tri-level office campus earlier this month. For the Bait & Tackle, the clock is ticking. O’Meara doesn’t foresee his landlord renewing his lease at an affordable rate. “We lose something like the Bait & Tackle, it’s like taking part of your heart,” says Durney. Writer Claudine Ko is a little disappointed that she missed the boat with Red Hook real estate. Follow her @lucidean or check out her other stories at www.claudineko.com.